MUMBAI, 7 MARCH 2017: The day has arrived where we salute the spirit of Women who play multiple roles of mother, daughter, sister, and a leader. It is time for us to appreciate the contribution that Women have made towards the society and also the sacrifices that they have done for their commitment towards families and children. 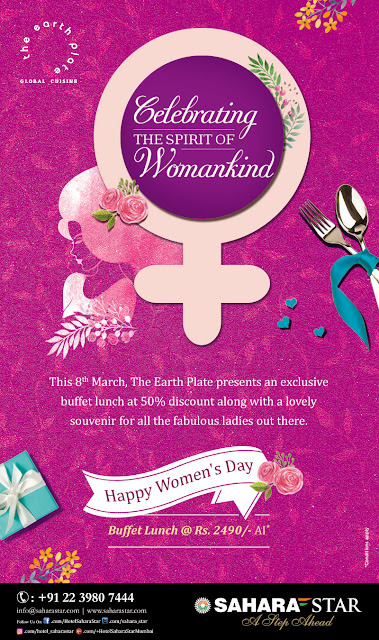 This Women’s Day, Hotel Sahara Star invites the ladies to leave behind their hectic schedules and enjoy a relaxing buffet lunch at Earthplate – the Global Cuisine restaurant at Hotel Sahara Star. The five-star deluxe Hotel is offering a lavish spread of buffet lunch on 8th March 2017 at a flat 50% discount exclusively for women. Chef Rupesh and Restaurant Manager Anish are all set to tantalize your taste buds with specially crafted home-style recipes consisting of sea food, meat, poultry and fresh vegetables cooked in a traditional way. With some excellent appetizers, main course and delectable desserts will surely make your dining experience a memorable one. Sip on to some special mocktails during the lunch while you enjoy a relaxed and luxurious ambience. The Hotel is also giving every Woman a special Women’s Day Mug as a memento. Join us to commemorate the Women’s Day celebration with an unforgettable experience! Note: AVC members will get 15 % discount. No other discounts will be applicable on FHRAI, H&RA card members, etc. No complimentary vouchers to be accepted. Two Discounts will not be applicable on one single table.